Therefore the overwhelming picture is one of the Bank of England continuing to kick the interest rate can down the road for the whole of 2016 and probably for the whole of 2017 too, even if inflation rises to above 2%. Where even a BrExit induced mini-sterling crisis is unlikely to prompt the BoE to shift on UK interest rates. Especially as I expect the UK economy to significantly weaken to an average GDP of 1.6% per annum that compares against BoE expectations of 2.6% per annum. The bottom line is that a paralysed BoE remains terrified of its banking brethren that could yet go bankrupt again, especially given Britain's continually expanding debt mountain, and thus will only hike rates when it is faced with an even worse crisis. In fact odds probably favour a CUT in interest rates rather than a RISE, maybe even going negative, though negative interest rates just do not work because they act as a tax on the economy instead of a stimulus. Low borrowing costs and savings interest rates are likely to continue to persist for the next 2 years. Therefore savers should eye fixes of at least 2 years for higher rates. Bank customers also need to be aware that there is a real risk of NEGATIVE interest rates, which means the BANKS will STEAL a percentage of your bank deposits each year. That's right, the banks take your bank deposit, loan it out at 5%, 10%, or 20% and then will CHARGE you for allowing them to do so with your money. If this is not the behaviour of crime syndicate then what is it? Expect further ongoing weakness for sterling, a trend forecast for which will follow in a separate analysis. Lack of rate hikes and the prospects for further easing are supportive of the stock and housing markets for 2016. So where do we stand now that BrExit has happened? The S&P has apparently downgraded Britain from its Triple AAA credit rating that it has held since 1978, even through the worst of the financial crisis to now AA. Though against the S&P also downgraded the whole of the European Union block from AA+ to AA though that masks internal differences of for instance Spain on BBB+, Greece B-, France AA, Italy BBB-1, In fact its only Germany with a higher credit rating than Britain of AAA. So where where ratings are concerned its always a case of where a nation stands relative to others, in which case the ratings as things stand today won't result in any real market impact, i.e. implied higher borrowing costs are NOT happening, instead borrowing costs have become CHEAPER post BrExit. a. The Bank of England rather than raising interest rates is instead likely to CUT interest rates over the coming months and probably quite soon, even at this months MPC meeting. Though whilst negative interest rates are possible, they are not probable because they would have a negative impact on banking sector profitability i.e. may have the opposite effect on the economy than intended. b. That the Bank of England is making available upto £250 billion for its banking brethren, to effectively lap up free money to trundle along and invest in government and corporate and of course the stock market, which means the potential £250 billion is QE in all but name! And you don't have to look far to see the effect that it has already had in sending stocks soaring into the stratosphere! 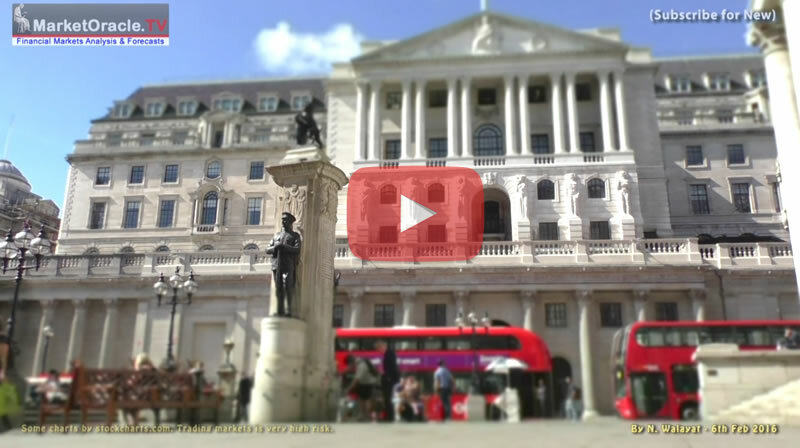 c. That the Bank of England is going to undertake more official QE, that's print more money on top of the estimated £500 billion to date, probably at least another £100 billion of QE over the next 12 months to inject into the UK economy via the banking sector primarily through the buying of government bonds i.e. monetizing UK government debt which has the effect of reducing Britains debt burden at the cost of inflation as printing money to monetize debt tends to push currencies lower. Though with the Pound already having fallen by about 12% then much of that has already been priced into the market. "In my view, and I am not pre-judging the views of the other independent Monetary Policy Committee (MPC) members, the economic outlook has deteriorated and some monetary policy easing will likely be required over the summer,"
"As we have seen elsewhere, if interest rates are too low - or negative - the hit to bank profitability could perversely reduce credit availability or even increase its overall price,"
So my advice to savers and investors of 5 months ago proved highly prescient that savers should seek to lock into the then higher savings rates being offered ahead of BrExit which since have continued to fall. In terms of the outlook for UK interest rates then expect the Bank of England to CUT the UK base rate as soon as at this months MPC meeting (July) from 0.5% to 0.25%, the expectations of which have already had the impact of typically shaving 0.5% off long-term fixed rate savings bonds. And if you think that a cut to 0.25% is a sign of crisis then what about the Euro-zone and Japan where the base rates are zero and bond yields and LIBOR are negative. It's because the crisis in the Euro-zone and Japan is MUCH worse than that of post Brexit Britain! And not forgetting the ticking time bomb that is GREECE! UK bonds have all year continued to trend in the opposite direction to that implied by increasing risks of a BrExit vote which is indicative of both central bank intervention and safe haven buying, with the most recent rise in the 10 year bond yield to 1.35 evaporating post Brexit, seeing the 10 year bond yield falling to an unprecedented 0.87%. Overall the UK bond market is showing none of the signs ALL YEAR of what operation fear had been warning of i.e. for a sharp rise in interest rates. 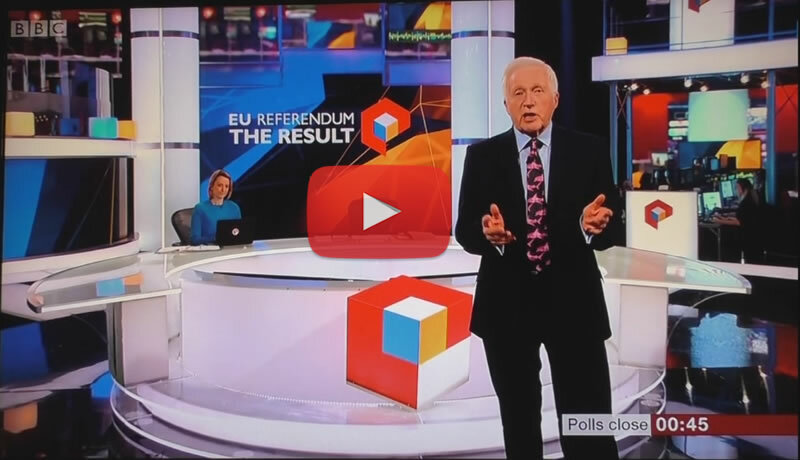 For how we got here see the highlights of BBC's 8 hour coverage of EU Referendum night. Also see how all hell broke lose once the polls closed Friday as the markets, bookmakers and pollsters ALL got the EU Referendum very badly wrong, as YouGov's 10pm poll convinced all, even Nigel Farage that REMAIN had won triggering a further sharp rally in the FTSE futures and sterling that was sustained until the actual results started to be announced shortly after midnight. Which I covered in this comprehensive video of exactly what happened in the markets during a very volatile trading session. Ensure you are subscribed to my always free newsletter as I fully evaluate the many future consequences of BrExit.